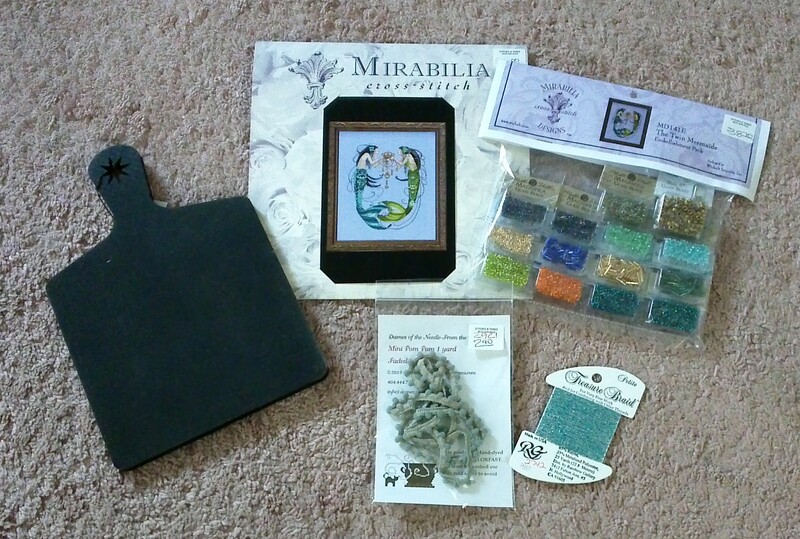 Afghans · Craft projects · Crochet · cross stitch · knitted scarves · Mirabilia · New stash! These fun things ended up in my bag from Stitches N Things. The newest Mirabilis pattern, Twin Mermaids and the bead pack. No plans to start this right away, but just had to have it. It’s 2 mermaids! And some threads and a horn book for an upcoming project. 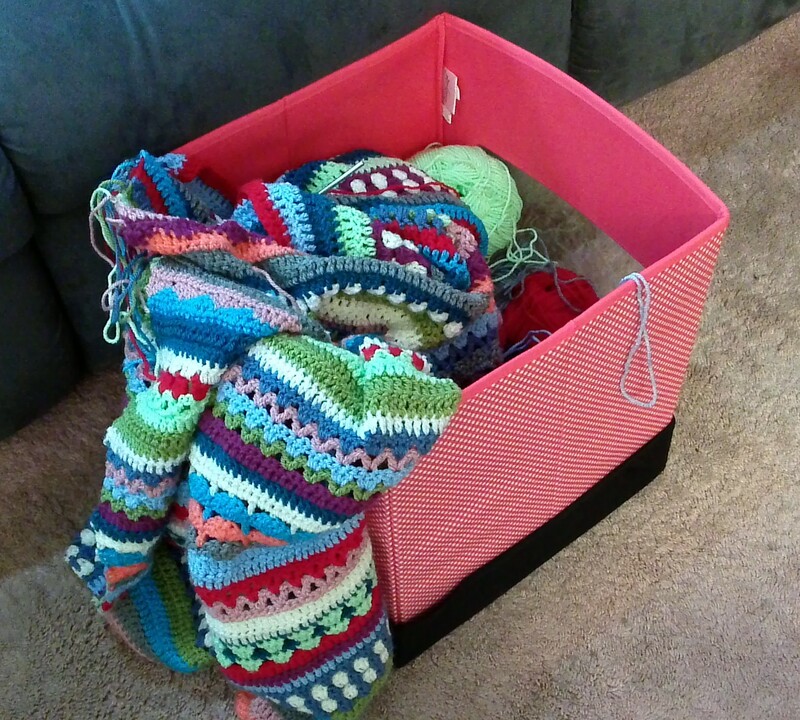 I didn’t get a picture of the yarn hank before I tore it all apart. I forgot to have them wind it for me, so ended up spending the whole trip home trying to detangle it. But as you can see, I started knitting a scarf already. The yarn is so awesome; lots of fun fibers and textures all in one skein! The yarn is Alp Premier from Feza. It was quite an expensive hank, but like I said, hubby spoiled me. So I can’t let this yarn just sit around. I will work on it in between everything else. And if you click on the picture, you will see those cool looking knitting needles I picked up. I had planned on starting this on the car ride home, and needed a pair of needles. These are from Knit Picks. Very pretty, made of wood, with very sharp points. They are actually very nice to knit with. I am glad I picked them up. I am also still crocheting on my Spice of Life blanket. I have 4 more rows to go before I start the border. This blanket has been keeping me warm the last couple of days while I crochet on it. I am really liking it and am hoping the border will not give me any problems so I can get it finished. We stopped at a bead shop while in Frankenmuth. Boy was I overwhelmed! I haven’t taken up beading yet. Not sure I ever will, but I like looking at all the beautiful beads and charms. Bead Haven was the largest bead shop I had ever been in and if I were going to shop that day for a project, I wouldn’t have known where to begin. Hubby found a rack in a corner of the store that had some hand made knitted items and he purchased this beautiful hat for me. I love it! It’s a pinky mauve color and fits me perfectly! I can’t wait for a little bit cooler weather so I can wear it. 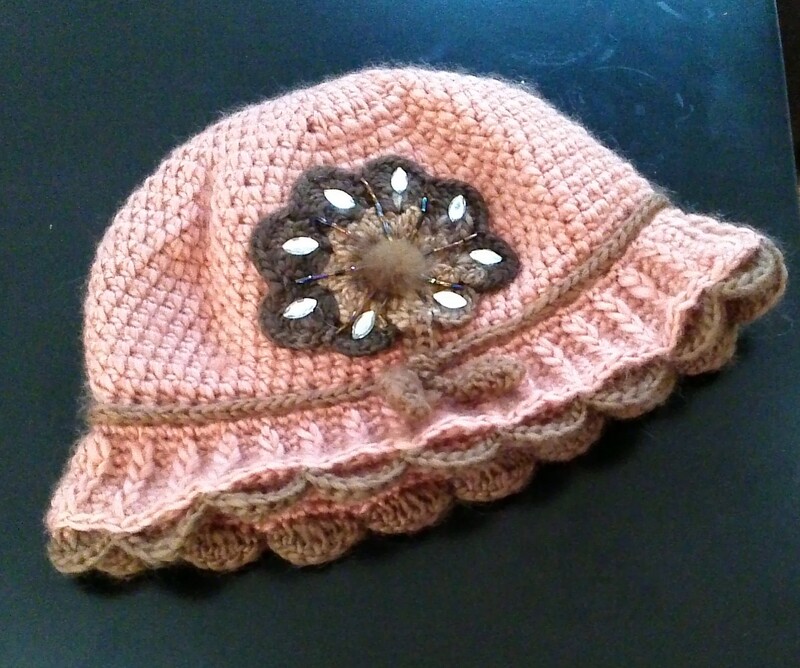 Someone did a wonderful job knitting it and lining and adding beads and fibers to the sweet knitted flower. 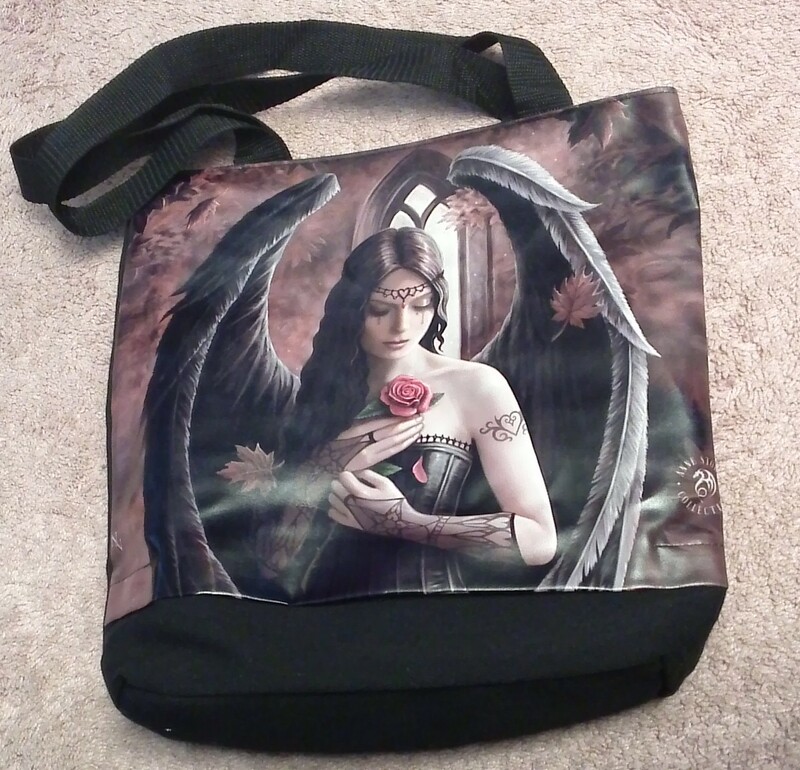 Dear husband bought me this awesome bag to carry around while shopping for the weekend. It is a very nice bag and held all the little things we picked up over the weekend. Right now it is holding my scarf project and it’s perfect. And for my most favorite purchase of the weekend… Hubby bought me this as an anniversary present from a wonderful shop called The Enchanted Garden. She is a beauty and I love her! She is 26″ tall and gorgeous! So I had a wonderful weekend and was spoiled to the max. So now I am off to crochet a bit and see if I can get those last few rows finished. What are you crafting on today? It’s getting quite long and keeps me nice and warm while I am crocheting on it. 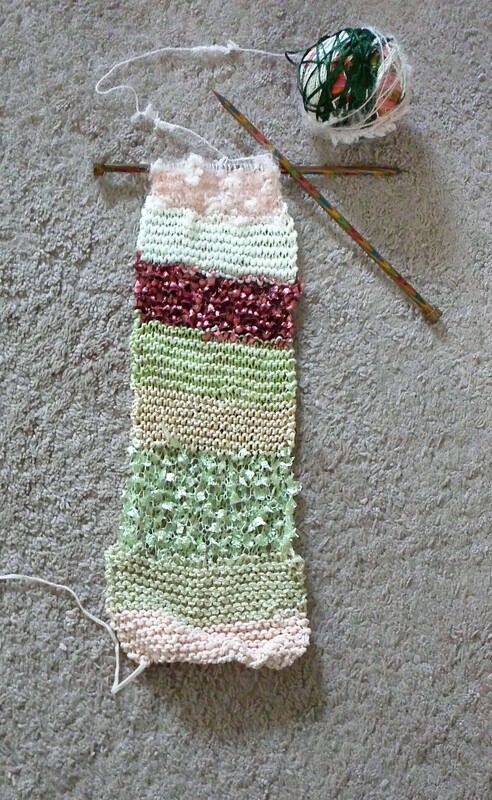 I have about 20 rows to complete on section 5 and then I can start the border which was released yesterday. So I am not too far behind. I have learned so much stitching on this blanket and have felt so close to my Step Mom who taught me to crochet when I was 12 years old. She taught me to do the basic stitches and the ripple afghan. I never really learned how to read a pattern or do complicated stitches. So I am doing this in honor of her. She passed away 4 years ago and I miss her dearly. 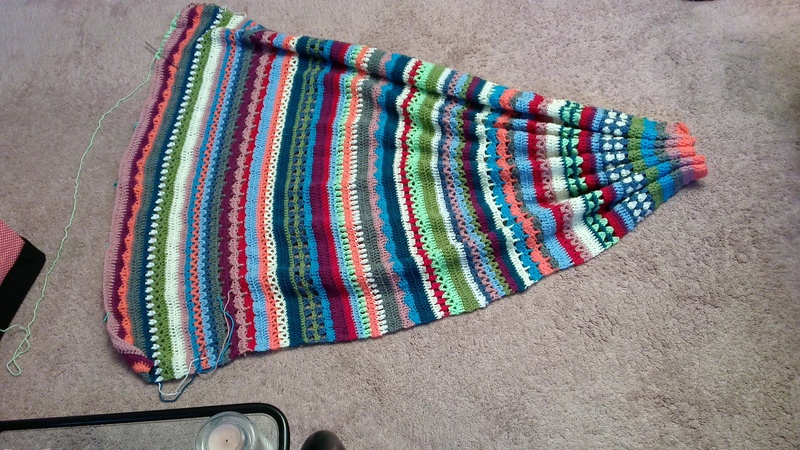 The Spice of Life blanket reminds me of the “scrapghans” she would make from her left over yarns. 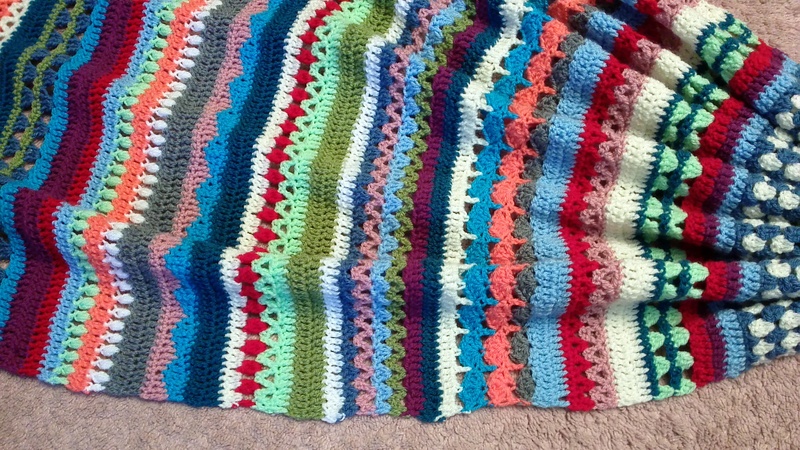 If you would like to create this beautiful blanket, you can get the pattern at Sandra’s Cherry Heart Blog here. Sandra did a wonderful job. 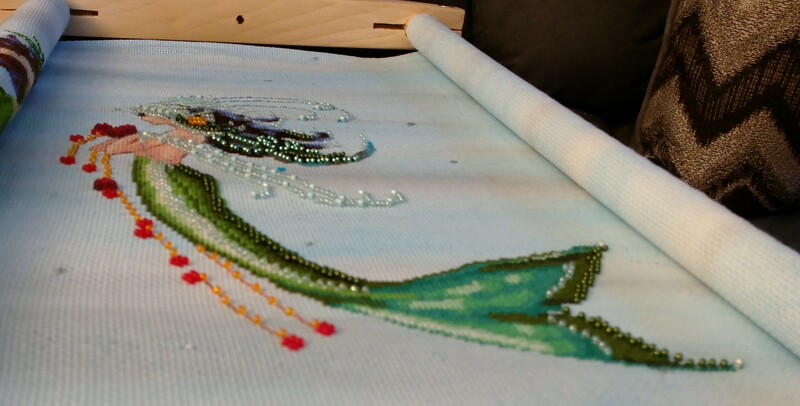 I have also been stitching on Mermaid Trio. Hubby says if I get it finished by Friday, we can take it in to be framed on our way out of town on Saturday. 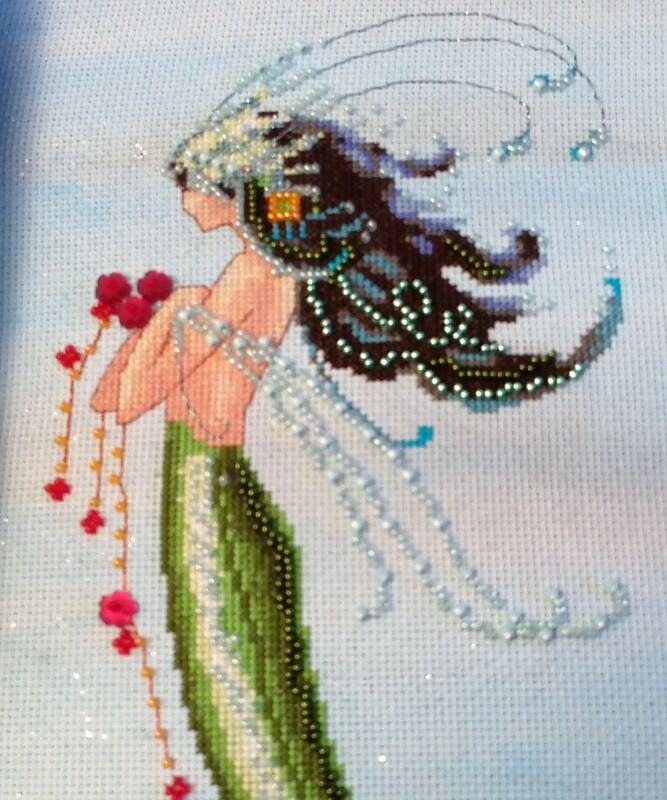 I finished beading Mermaid Verde last week and she turned out so sweet! I love how she turned out. Now I am working on beading Coral Charms and she has so many beads! I am hoping to finish her today so that I can get started on the last mermaid and get her finished by Friday night. I will keep you posted on my progress. 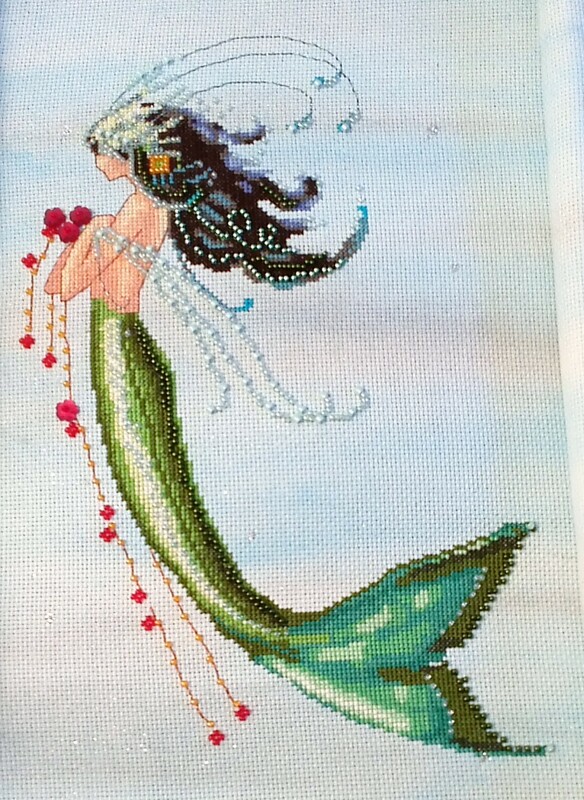 For those that are not familiar with the patterns, they are La Petite Mermaids by Nora Corbett. I am stitching them on 16ct Aida Summer Showers by Sunny Dyes fabrics. That is my update for today. What is on your needles today?